The TT-BH07 is a wireless pair of earbuds that’s IPX6 certified water resistant, which means they’ll be fine against anything short of full immersion. 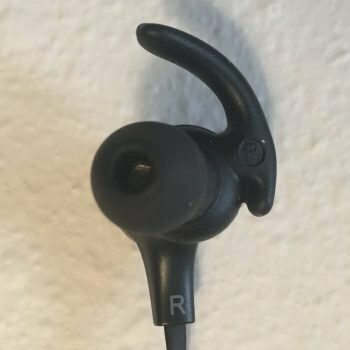 The earbuds are merely connected to each other and don’t have a 3.5mm jack, meaning these are only usable via Bluetooth. This model is currently not officially listed on Taotronics’ website, though it’s still available and quite popular on Amazon after seeing apparently significant MSRP discounts. Packaging: pretty basic but decent enough – and outer and inner box both unfold to reveal the carrying bag, which incidentally gives some extra padding, with the earbuds inside in a plastic baggie. The accessories were at the bottom below the bag. 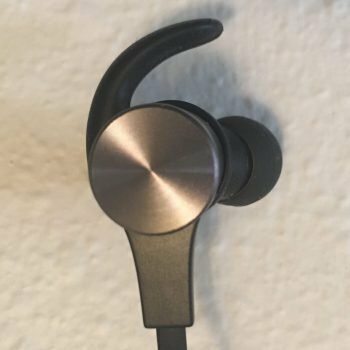 Fit/comfort: the bud uses a double pad with a small ear pad on the inside and the tip on the outside. An interesting feature of these earbuds is that the metallic back is actually a magnet, so you can stick the earbuds together. That’s neat, but, I feel like it adds unnecessary weight to the earbud which kind of drags it down a bit when in-ear. I was able to get a decent enough fit, but I did notice I’d lose a proper seal if I moved my jaw enough. Wire: the connecting wire is pretty light flimsy and caused some microphonics. Mic/in-line controls: the mic is below the right earbud and has very basic volume/tracking buttons and a play/pause/pair/call button. The female micro usb input for charging is on the opposite side and has an attached rubber cap. Overall the build, feel, and fit seems pretty basic but adequate, with a few minor but not deal breaking flaws. Set up: since these are Bluetooth only you’ll need to charge them first, but I was able to get a full initial charge in like 15 minutes, so I think they might come with some juice in them. Battery life is ~9 hours which is comparatively OK.
General impression: these sounded impressively good for budget wireless earbuds, no perceptible flaws that are often attributable to cheap headphones. I was very surprised to see a few other popular publications say the sound quality of the TT-BH07 was poor, and frankly I don’t know why the discrepancy. It’s possible I got a newer version with improved hardware but I’d say that’s unlikely since these aren’t officially listed anymore. Sound signature: the response curve was definitely flat/neutral, perhaps a little round, but very nice and even save for a bit of roll off at the bottom. The mids/highs had great detail and clarity but it still had that nice and full sensation that I personally like rather than being thin and harsh. The only significant criticism I have is that the background hiss/static of the Bluetooth was somewhat significant, and you could hear it on quieter and less dense classical songs and such. Bass: a little recessed but still sounded decent. Various drops came through fine and weren’t muddy or toneless, and there wasn’t any bleeding. There’s definitely aren’t basshead emphasized earbuds if that’s what you’re after. Power/Volume: I had to crank up the volume a little more than I normally do but I don’t see why these couldn’t get plenty loud. Isolation: the so called cvc 6.0 “noise cancelling” only helps outbound noise through the mic and won’t do anything on your end while listening to music. I’d put the isolation at light – maybe a little help blocking ambient noise but not much. Warranty: Taotronics offers a 1 year warranty by default but also an 18 month extension if you register your product, making the cumulative 2.5 year warranty one of the best I’ve seen for budget earbuds, especially so for one that’s graded for weather/water resistance. The TT-BH07 is a fairly basic but decently comfortable weather/water resistant pair of earbuds that has, overall, very good sound quality for a now modest price, partly thanks to apparent discounts from the original MSRP. All in all a solidly viable choice, and one that might not be available for too much longer as the TT-BH07 appears to be officially discontinued.